Definition at line 450 of file _iterator_base.h. Definition at line 445 of file _iterator_base.h. Definition at line 431 of file _iterator_base.h. Definition at line 159 of file _iterator_base.h. Definition at line 97 of file _iterator_base.h. Definition at line 99 of file _iterator_base.h. Definition at line 96 of file _iterator_base.h. Definition at line 98 of file _iterator_base.h. Definition at line 480 of file _iterator_base.h. Definition at line 486 of file _iterator_base.h. Definition at line 498 of file _iterator_base.h. Definition at line 508 of file _iterator_base.h. Definition at line 223 of file _iterator_base.h. Definition at line 228 of file _iterator_base.h. 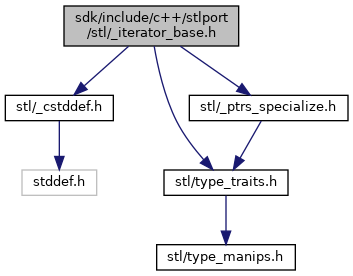 Referenced by _Advance(), _SlistDbgTraits< _Traits >::_Check(), _Decrement(), _Dereferenceable(), _Incrementable(), basic_string< char, char_traits< char >, allocator< char > >::_Invalidate_iterator(), deque< IncompleteClass >::_Invalidate_iterator(), list< BookmarkNode >::_Invalidate_iterator(), slist< value_type, _All >::_Invalidate_iterator(), _Rb_tree< key_type, key_compare, value_type, _STLP_SELECT1ST(value_type, void), _MapTraits, _Alloc >::_Invalidate_iterator(), hashtable< _Value, _Value, _HashFcn, _UnorderedMultisetTraits, _STLP_PRIV _Identity< _Value >, _EqualKey, _Alloc >::_Invalidate_iterator(), vector< CTestInfo >::_Invalidate_iterator(), _Non_Dbg_iter(), unordered_set< _Value,,, >::erase(), unordered_map< _Key, _Tp,,, >::erase(), hash_set< _Value,,, >::erase(), hash_map< _Key, _Tp,,, >::erase(), unordered_multiset< _Value,,, >::erase(), unordered_multimap< _Key, _Tp,,, >::erase(), hash_multiset< _Value,,, >::erase(), hash_multimap< _Key, _Tp,,, >::erase(), hashtable< _Value, _Value, _HashFcn, _UnorderedMultisetTraits, _STLP_PRIV _Identity< _Value >, _EqualKey, _Alloc >::erase(), operator+(), unordered_map< _Key, _Tp,,, >::operator(), hash_map< _Key, _Tp,,, >::operator(), and while(). Definition at line 211 of file _iterator_base.h. Definition at line 216 of file _iterator_base.h. Definition at line 235 of file _iterator_base.h. Definition at line 240 of file _iterator_base.h. Definition at line 515 of file _iterator_base.h. Referenced by __equal_range(), __inplace_stable_partition(), __lower_bound(), __merge_adaptive(), __merge_without_buffer(), __stable_partition_adaptive(), __upper_bound(), basic_string< char, char_traits< char >, allocator< char > >::_M_insertT(), vector< CTestInfo >::_M_range_insert_aux(), AdvanceTest::adv(), af_latin_metrics_check_digits(), af_shaper_get_elem(), ListTest::allocator_with_state(), SlistTest::allocator_with_state(), apply_pair_value(), vector< CTestInfo >::assign(), deque< IncompleteClass >::assign(), cf2_interpT2CharString(), cff_slot_load(), compute_glyph_metrics(), dexec(), do_insert_range(), ft_synthesize_vertical_metrics(), get_cluster_advance(), get_glyph_cluster_advance(), GPOS_apply_ChainContextPos(), GPOS_apply_ContextPos(), GPOS_apply_feature(), GPOS_apply_lookup(), GPOS_apply_PairAdjustment(), GPOS_apply_SingleAdjustment(), OpenType_apply_GPOS_lookup(), test_insert_one< C >::operator()(), test_insert_n< C >::operator()(), pfr_face_init(), pfr_load_bitmap_metrics(), pfr_slot_load(), ScriptApplyLogicalWidth(), ScriptCPtoX(), ScriptGetLogicalWidths(), ScriptJustify(), ScriptStringGetLogicalWidths(), SlistTest::splice(), test_ScriptXtoX(), MoveConstructorTest::vector_test(), and ZSTD_compressBlock_opt_generic(). Definition at line 366 of file _iterator_base.h. Definition at line 319 of file _iterator_base.h. Definition at line 315 of file _iterator_base.h. Definition at line 322 of file _iterator_base.h. Referenced by __advance(), advance(), distance(), and while().